Each comic strip is a one-of-a-kind, hand drawn original by me. Digital coloring is also available. 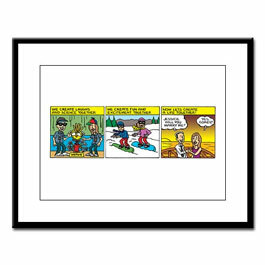 The comic strips are 4″ x 13″ drawings on a 5 1/2″ x 14″ piece of bristol board and look just as professional as the ones you see in the daily newspapers! The original artwork is black and white ink. I do provide Digital Coloring and would provide you with a high-resolution file that you can have printed locally. As an additional option for $39.99, I do work with a third party vendor, CafePress, that will Frame a High-Resolution Print of your Artwork if you’d like. Please allow enough time for shipping. This option will be available to you when the project is completed. Due to the size, comics are best with a maximum of four panels (blocks.) 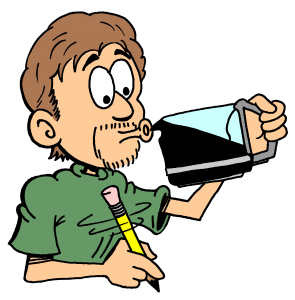 If your idea runs longer, additional charges may apply, or you may want to consider a Custom Comic Book Page..
AND RELAX – you only have to provide me a brief description of the “theme” and a couple of pictures and I’ll do the rest! I’ll write the dialogue and share the ideas with you. Once approved, I’ll mail you the finished drawing as well as email you a high-resolution digital copy that you can have printed locally. Get started and email me your initial idea!